Combining history, tradition and precision, the Longines Heritage 1973 is based on a model produced by the brand in 1973. This new creation is fitted with the exclusive Longines column-wheel chronograph movement. The shape of the case and the subtle play of contrasts on the dial provide this model with a distinctive and harmonious image. The elegance of the 70s has been updated to suit modern tastes. The Longines Heritage 1973 is immediately eye-catching. The cushion-shaped case elegantly surrounds the dial, which is thoroughly vintage and true to the original model. 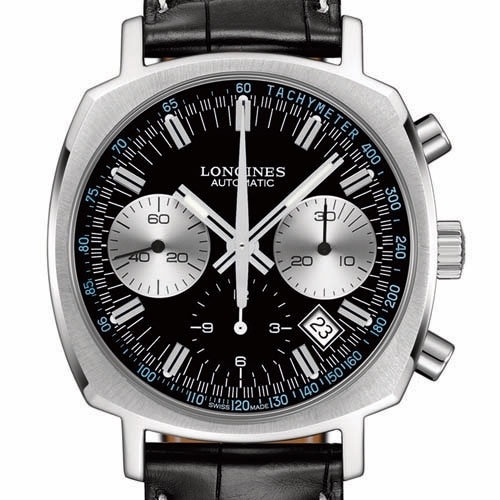 The latter, a chronograph produced in 1973 by the brand known by its winged hourglass logo, was fitted with a Longines mechanical chronograph movement, the 30CH. Following in the same noble footsteps, the Longines Heritage 1973 houses the L688 calibre, a column-wheel chronograph movement developed and produced by ETA exclusively for Longines. Black or silvered, the dial of the Longines Heritage 1973 boasts a fascinating play of contrasts. Two counters have been included at 3 and 9 o'clock: black on the silvered dial and silvered on the black dial. The applied hour symbols are decorated with a fine black line and a dot of Super-LumiNova®. These are interposed and balanced out by a minute-circle, also of fine black lines. A blue tachometric scale surrounds the dial, adding a subtle touch of colour to the whole. With a diameter of 40 mm, the cushion-shaped steel dial of the Longines Heritage 1973 has retained the lines and mood of the original model. The back is fitted with a transparent sapphire glass cover through which the wearer can admire the movement of the calibre as well as the blue column-wheel. The harmonious form of this model is completed by the rounded push-pieces, and the whole is mounted on a black alligator strap.